The object is to uncover a background image by drawing rectangles with your cursor. 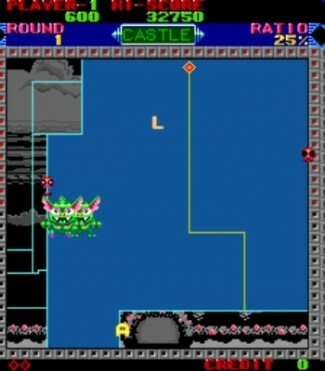 You must avoid several enemies on the screen while doing this. Bonus points are awarded for uncovering a larger portion of the image than the minimum. Obviously, this game is a sequel to Qix. The gameplay is identical, it just has better graphics. The ‘bad guy’ looks like a Gremlin from the movie rather than lines like in the original. You also have power-ups that appear when you complete a square such as faster speed, a one-time shield against hitting a bad guy, warp to the next level, etc. You can also collect letters that may appear instead if the power up, and if you spell a word you get bonus points. I also received a free credit once for completing 98 percent of the level.